BRT’s founders, Tim and Laura ran the North Face 100 last weekend. 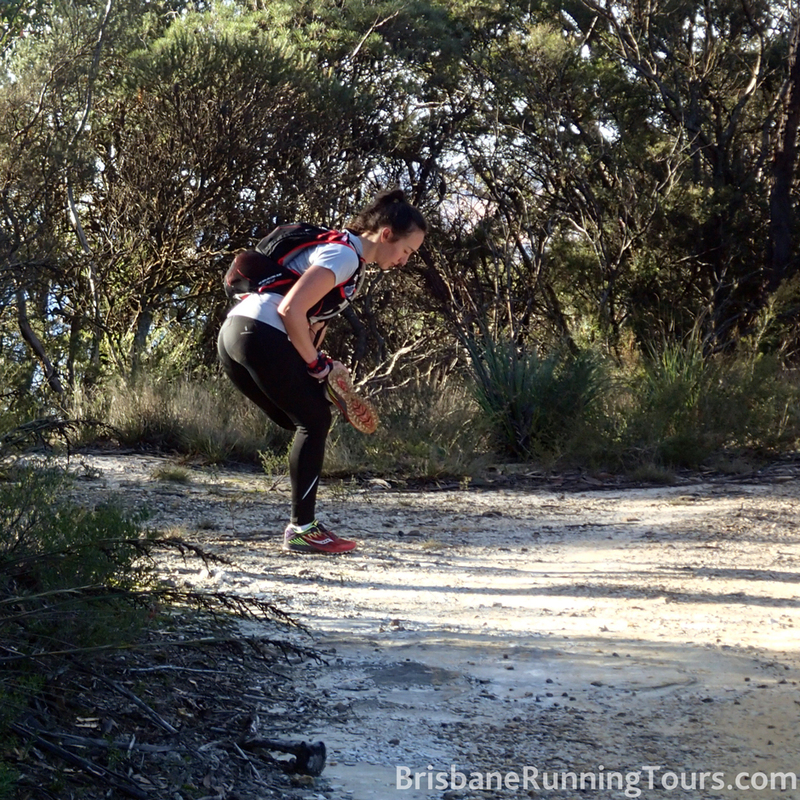 That’s 100km through some of the most beautiful and hilly terrain in Australia. 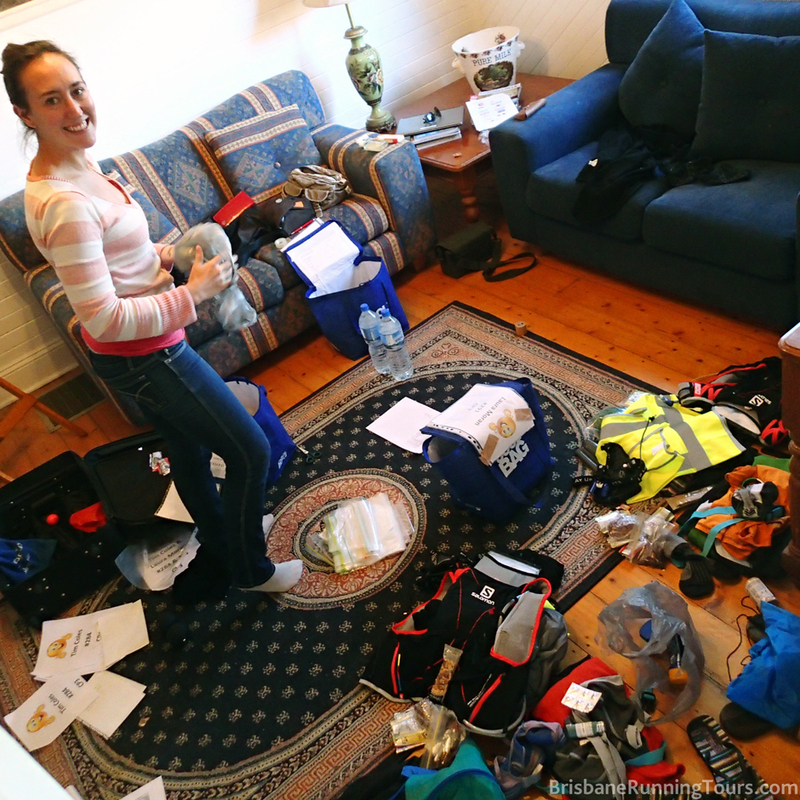 During the lead up, Laura documented the training with a ‘photo a day’ and it all culminated in last weekend’s challenging and rewarding finale. Please enjoy Laura’s race report, below. 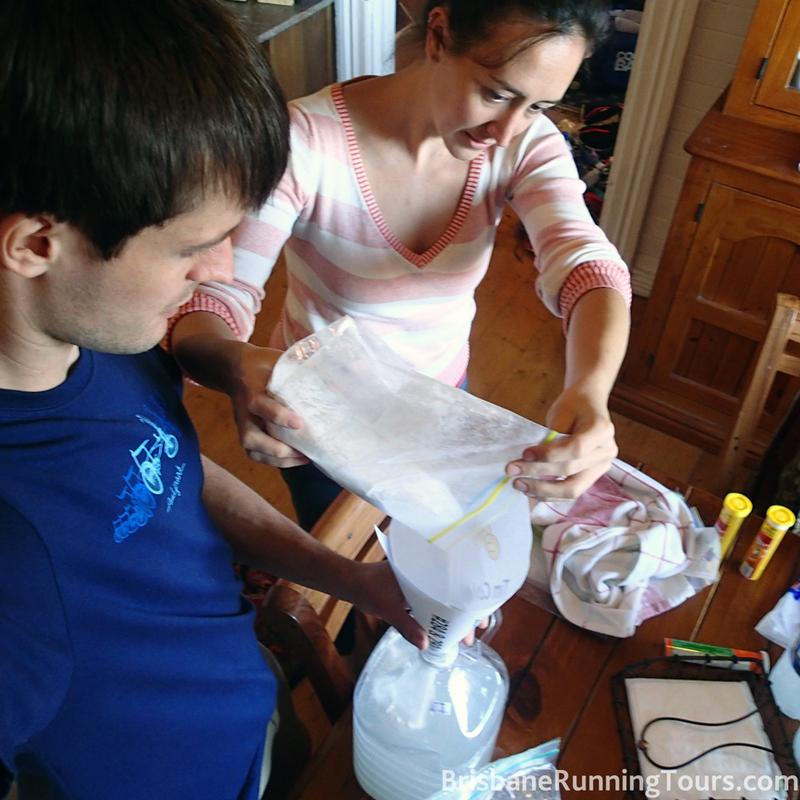 The idea of running an ultra marathon was not something that had ever occurred to me. I’d completed one road marathon – the incredibly flat Berlin course – in 2011 and considered that item well and truly ticked off the bucket list. My other half, on the other hand had decided to celebrate his 29th birthday, in May 2013, by completing an Ironman.. despite never having done a triathlon, run a marathon or ridden a road bike. This sort of thing is right up Tim’s alley. 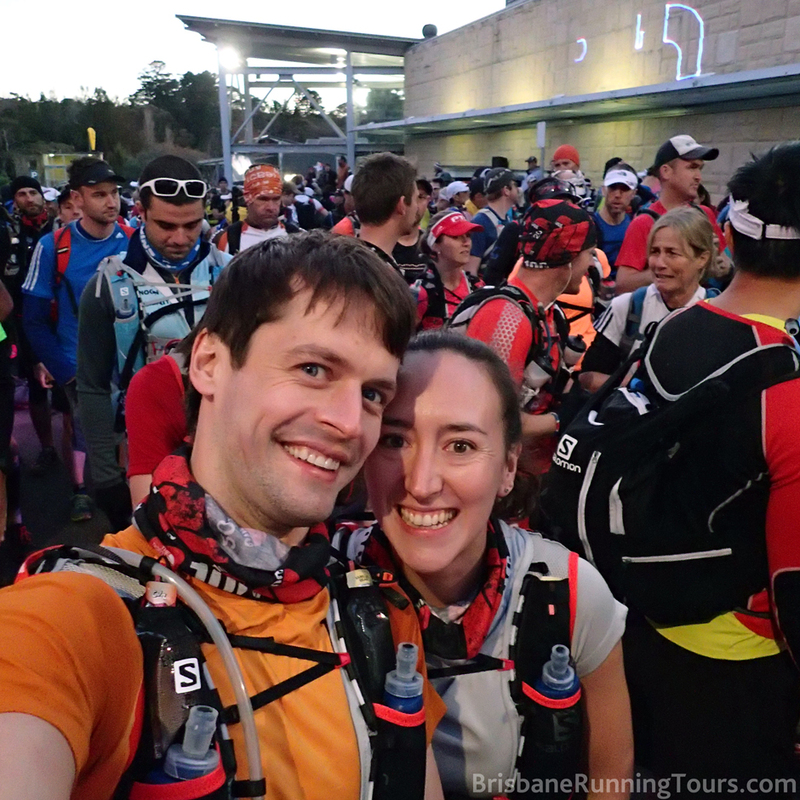 It’s hard to say no to someone who starts their request with ‘so I was thinking for my 30th..’ though and thus, I found myself lining up with about 1000 other mildly crazy runners on a beautiful Blue Mountains morning in May 2014, ready to embark on our first 100km. 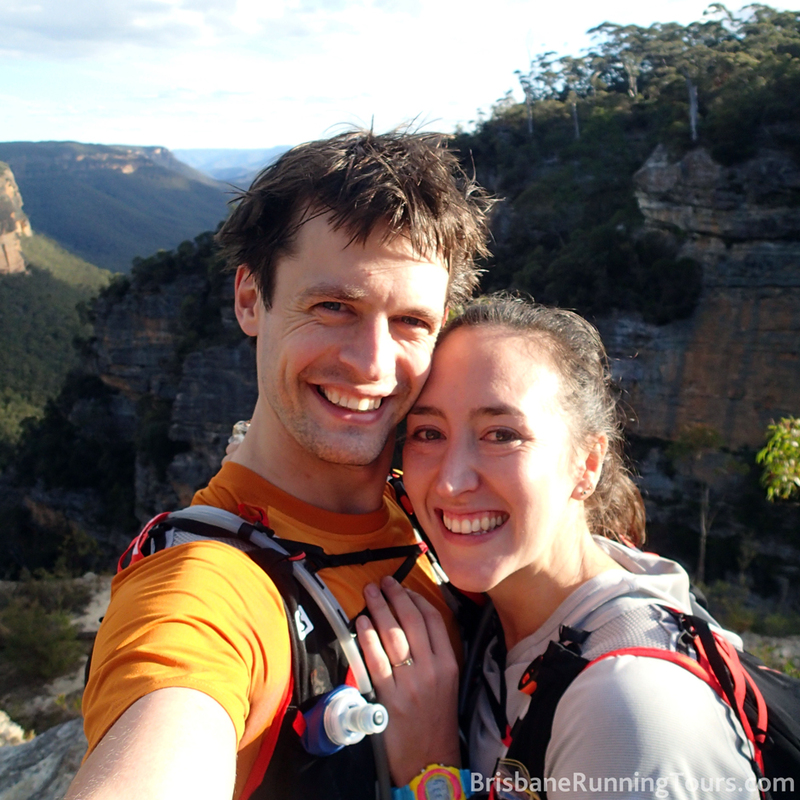 Tim and I are both keen trail runners already and we’d had a really fantastic build up in training. 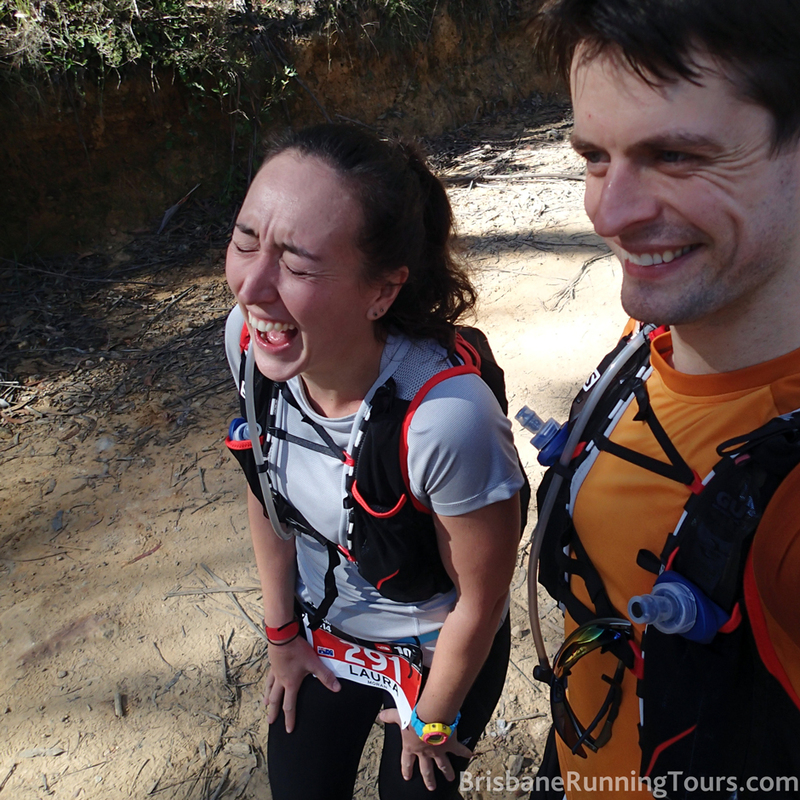 Our first Ultra, the Nerang State Forest 50km, 6 weeks prior, had been a bigger success than either of us anticipated and my concerns about making the cut off for the second lap proved completely unfounded when I surprised myself and somehow crossed the line as the third placed woman. We were feeling fit and fantastic until about 2 weeks before the run when I was struck with a knee injury and Tim with one in his foot. We saw our respective specialists, bought copious amounts of strapping tape and crossed every finger and toe we owned. This was happening! The day of registration we checked and rechecked our gear before heading down to drop our bags off in the big trucks and collect our numbers. The vibe in the hall was great and we were soon seated and eager to listen to the panel of expert runners. It was quite entertaining watching the host attempt to create conversation amongst a group of people who have built success on being able to spend very long hours with only their own minds for company but he managed well. They had some great insight and I was especially interested in the (very long) story by one runner of how he had failed in spectacular fashion the first year he’d attempted this race. As it turned out, his experience would resonate a lot with mine throughout the next 48 hours. After the panel came the official welcome and briefing. I especially loved the Welcome to Country delivered by Aunty Mary, an 80 year old Indigenous local who spent her youth wandering the same country we were about to explore. What a woman! 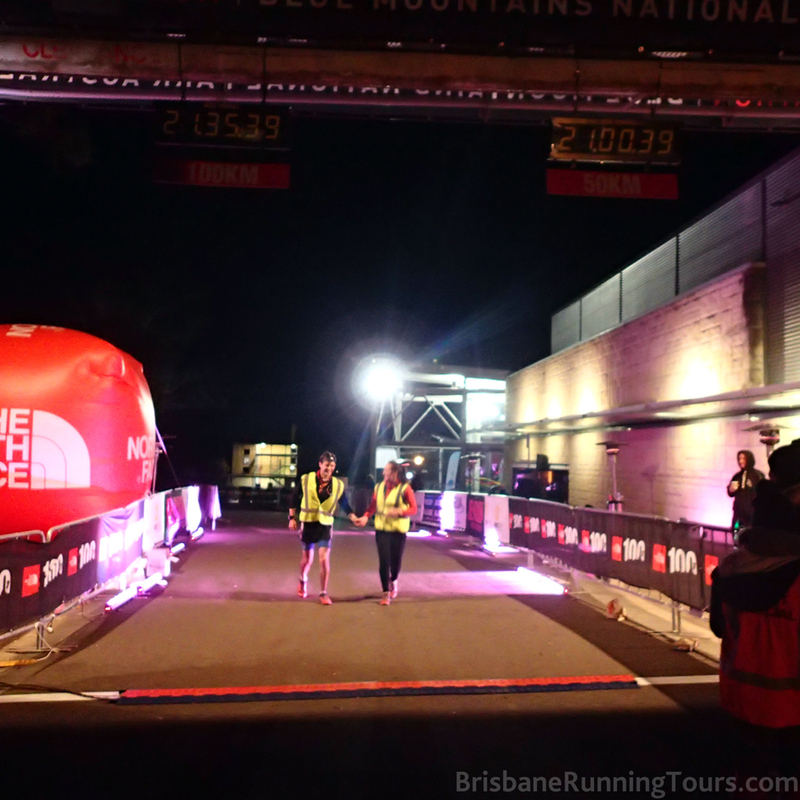 After a last pack of our bags and quelling of our nerves, we managed to get a small amount of sleep that night and were back up and at Scenic World ready for our 6.38 start the following morning. With the unknown element of our injuries, the plan was to start out by working towards the pace we wanted to achieve and see how we went. The gun went and before we knew it, we were off! The short, initial road section of the run passed fairly smoothly and before long we were on the trails – the best place in the world to be running! There were lots of spectators towards the beginning calling out our names, thanks to personalised bibs, and making the whole affair that much more fun but we quickly left them behind. The descent down that first set of stairs was a little slow due to the crowds but we managed to get ourselves into a small gap and start striding out to a good pace. It was about 7km in when my petulant knee decided that it actually wasn’t so keen on what we were asking it to do. Despite all my hopes that it would hold up well under the taping, it was already twanging painfully with each step and I was somewhat relieved when we found ourselves stuck in another group of slower runners on the single track. I’ve never been on such a crowded trail run and it was something else to wind around the ridge as part of that long line of like minded, equally mad, individuals. It was a beautiful place to be running although a lot of the concentration went on clambering over rocks and then hauling ourselves up the Golden Stairs towards Checkpoint 1. First severe pain. Thanks for that photo Tim! At the top, we reached the flat and started running again but this is where I found out my knee was not happy with me at all. We made it to the first checkpoint at 10.5km but had barely gotten around the bend on the other side before I was struck with a sort of cramping that made it impossible to walk. Tim spent some time massaging my ITB, much to the amusement of many fellow runners, and we headed off tentatively. 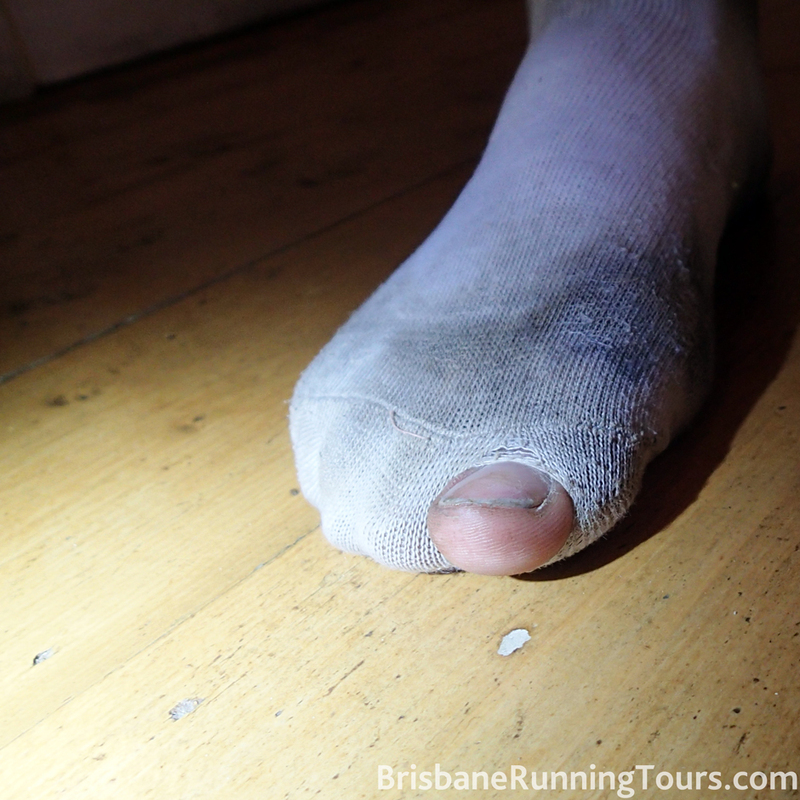 As we ran along the top of Narrow Neck, I found my rhythm and left Tim to redo his own foot strapping so that I could keep moving which seemed to keep the pain at bay. I was feeling really good at this point with the hope that the knee was not going to be a constant burden and I could run while I was feeling up to it. Tim caught back up before the 20km mark and we jogged along happily together, snapping pictures and enjoying the stunning Autumn day. Maybe my knee had loosened up and would leave us alone now! We wound our way down to Tarros ladders and joined the short queue, glad to be able to include this unusual feature of the event in our day. 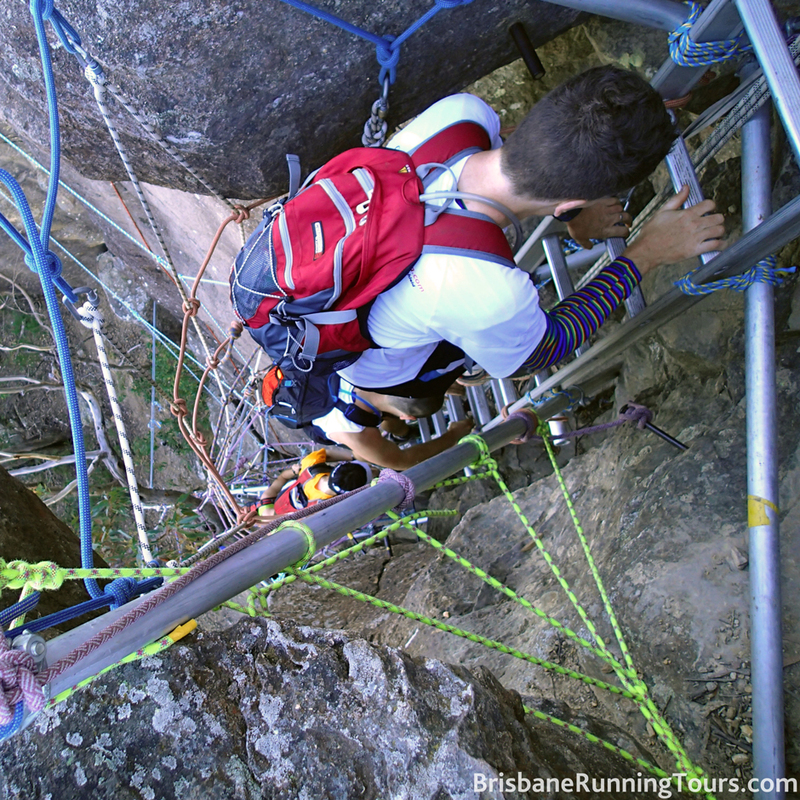 The ladders are in place to help runners quickly descend a rocky section of the trail which is usually traversed through the use of steel pegs in the rock face. Definitely a first for us in any trail run we’ve done and a lot shorter than I had expected. They were over quickly and before we knew it, we were back amongst the trees and rocks that make trail running so much fun. We were having a ball. Back on the fire trails, my knee decided it hadn’t had enough attention for a while and flared back up again. We seemed to alternate between my knee seizing up and Tim’s foot hurting. When I needed to stop he would work hard on easing the tension around the knee, joking that he never expected to get such a tired arm while running. When he needed to stop, to add yet another layer of strapping around his foot, I carried on, afraid to do anything but keep moving. We would pass runners while taking advantage of any opportunity to run only to be passed by the same runners down the road, when the wave of pain washed back over one or the other of us. It became a bizarrely comforting routine which we settled into and in no time we were arriving in Checkpoint 2 at Dunphy’s Camp. As I had discovered was inevitable, when I stopped moving the knee seized up so we were a lot longer at this checkpoint than we’d have liked but a small, vigorous massage later, we were back on the trail and passing through farmland on our way up to Iron Pot. 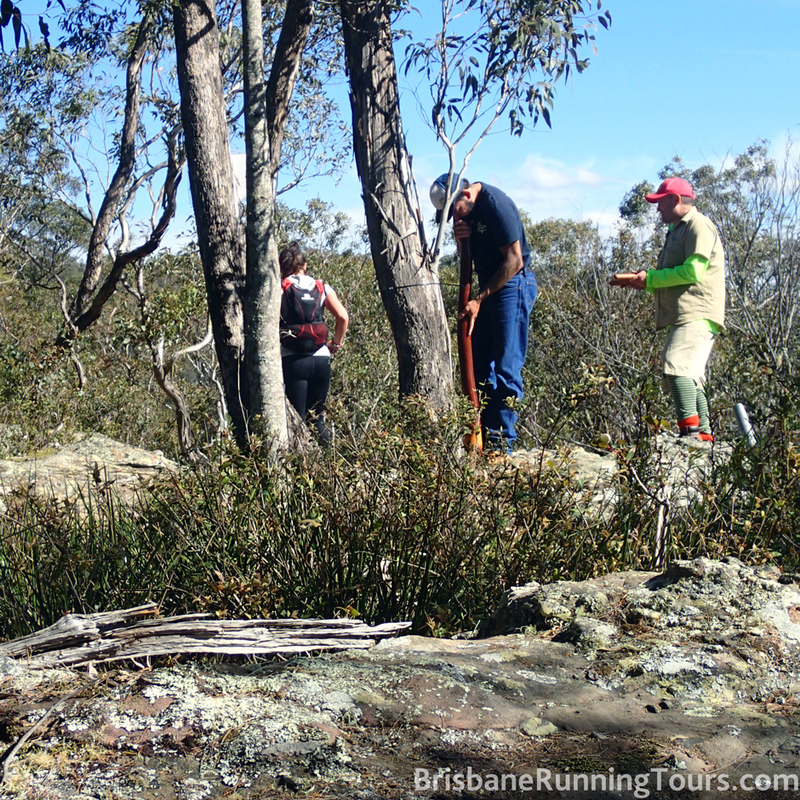 This was a scramble of rocks, roots and loose ground heading up to a rocky outcrop. There was an out and back section of trail meaning we were lucky enough to twice pass the musicians with clap sticks and didgeridoo that greeted us at the top and then we were off the ridge and descending a slippery, dusty slope. I absolutely love down hill runs. Especially those which require you to just let loose and trust your feet. This was one of those and we took it at a good pace, passing many others who were a little more wary of the rough footing. I knew as I was flying down the slope that I would probably pay for it later but I let go and enjoyed it all the same. You can’t fault a musical interlude mid run. Thanks guys! I was right about paying for it and we quickly found ourselves stopped again with horrible cramping around my knee. Many of our now familiar fellow runners offered salt and encouragement as they passed and eventually we continued on. 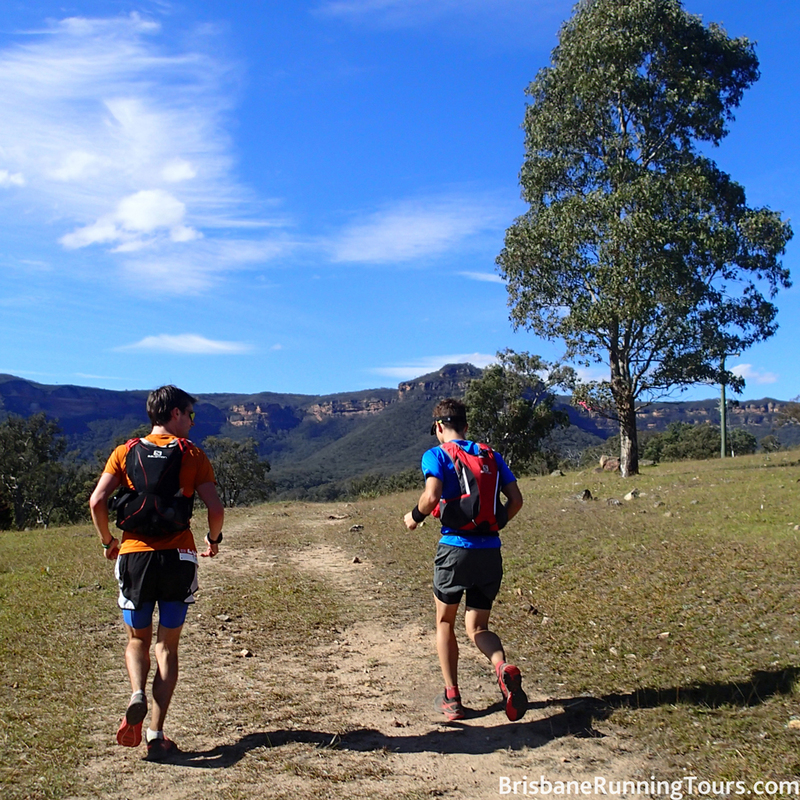 We crossed heart warmingly Aussie looking farmland, always within visual range of the dramatic Blue Mountains ridges, and chatted to fellow runners until we got to the Megalong Rd ascent. Another stop halfway up, another painful massage, and we were off again. I was determined not to stop until the next checkpoint but a gear check just outside forced us to pull up and I found that I was almost unable to walk into Checkpoint 3, let alone out the other side. Tim was all over the retrieval of the drop bag and helping to swap out our nutrition while I tried to loosen up my leg. He ran off and found a spectator who was kind enough to donate two pain killers to our cause and then ushered me out of the checkpoint. On the other side, I laid down while he worked on the ITB and lots of runners passed us checking we were okay. It was an interesting approach but I see where he was going – we didn’t want to get too comfortable in any of the checkpoints. Making friends along the route. I love the Ultra running atmosphere! We trotted along the Six Foot Track for a while but my hip was now starting to ache and it was a battle between needing to rest it and knowing that if I stopped, I’d be in trouble. I stopped. It was trouble! The waves of pain seemed to crash down on me quite suddenly and I had the shakes, was breathing quickly and had tears streaming down my face. Giving up never occurred to me but it did cross my mind that if I couldn’t stand at this moment, we may actually not make the cut off of 28hrs. But this was Tim’s 30th birthday present and I wasn’t going to ruin it for him any more than I could help. The pain killers began to kick in, Tim finished taking photos of my lowest moment and we set off at a steady, determined march. This worked really well and we were soon onto single track and passing friendly faces we had thought were long gone. They encouraged us and joked about Tim giving them a massage too and we waved and promised we’d see them again in a few kilometres. Up Nellies Glen and we were going strong. As it turned out, climbing stairs was the most comfortable thing for me and we powered up them faster than I would have thought possible; a much needed boost to the spirit. At the top we took the opportunity to detour down one of the side paths which promised a stunning view across the Megalong Valley, calling back at one runner who almost followed us down the dead end! We had always said we’d approach this event with a view to enjoying ourselves first and foremost, so why not soak up the view while we got some food in our bellies. A few metres off the route and we were standing on the edge of the drop off looking out on one of the most spectacular views in the world. We munched on some sweet potato brownie, took a couple of pictures and then I moved to get back into the run. Turning back to see if Tim was going to follow I saw that he had a goofy grin on his face and was holding a delicate, diamond ring. When he said, ‘Laura, will you marry me?’ my first answer was ‘Yes’. My second was, ‘Are you joking’? He wasn’t and suddenly I had a far more precious prize that the belt buckle we’d been chasing. It didn’t matter what time we finished now – but finish we would! We were both grinning broadly as we rejoined the course and passed another runner who was struggling through some ITB pain. We gave her encouragement and carried on, before long coming out onto the road and heading towards Checkpoint 4. I couldn’t stop looking down at the ring and was terrified of losing it. Poor Tim must have been distracted, carrying that in his pocket for over 50km! Unlike the other, outdoor Checkpoints, the fourth was in a hall and the support in there was great. A very helpful volunteer helped Tim with our bag while I hobbled off to find a bathroom, enjoying the encouragement of the non-runners in the queue who ushered me forward when a stall opened up. Tim used the opportunity to hunt down our next set of donated pain killers and then we were back out on the course again. It was wonderful to think we were well over halfway and had run (walked and hobbled) further than ever before. The afternoon was wearing on but our new tactic of ‘walking with purpose’ (thank you to the ‘Unofficial North Face Training’ for this mantra) was paying off. My knee settled into a dull throb rather than the debilitating pain that had stopped us so many times already. The aim now was to finish on the same day and we were still ahead of that goal with time up our sleeves for the steeper sections. Things were looking good. 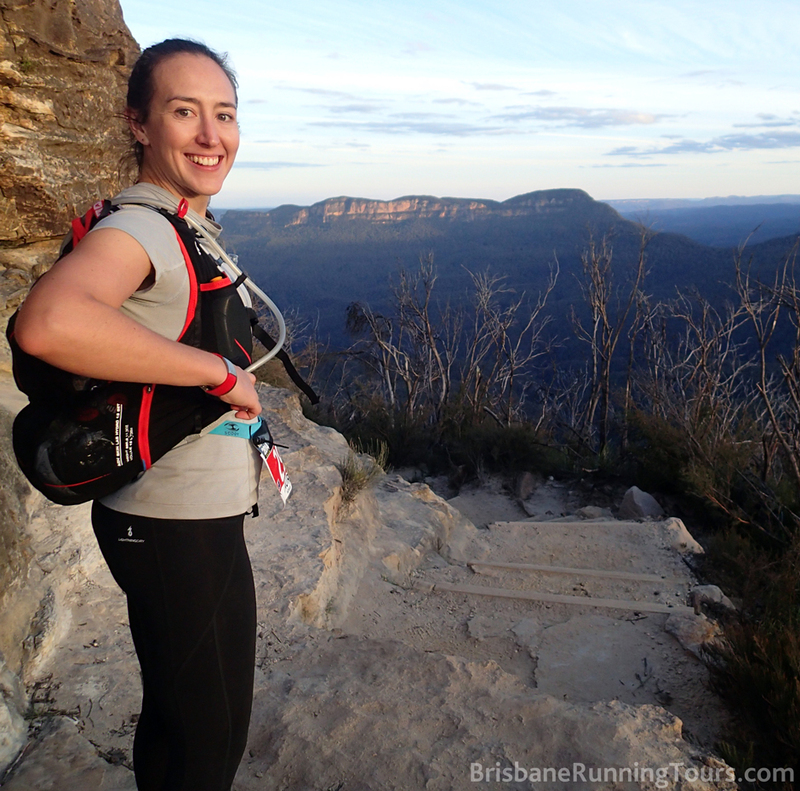 We powered along the cliff paths, passing far more tourists now and eventually came out at the Echo Point lookout, where many tourists milled around taking in the view of the Three Sisters and the strange procession of runners (walkers and hobblers) passing through. One man asked me what the run was and then how long it had been going for. I said about 7 years and then laughed to Tim as we headed towards the Giant Staircase that he probably meant how long had it been going for today. Still at times, 7 years may have felt accurate! Descending down to the Three Sisters. We moved down the Giant Staircase quite quickly and were suddenly back in the valley. 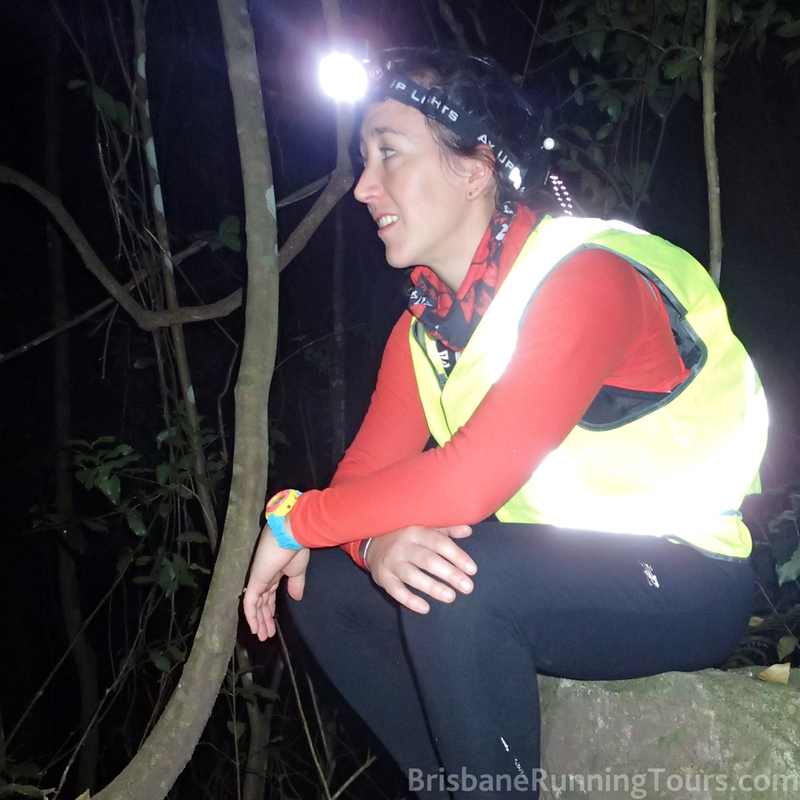 The sun was not fully set but under the trees it was now quite dark so we donned our head torches as we set out along the track. We settled into a steady pace behind a chatty trio and the five of us made good ground, past some 50km runners heading the opposite way and up to Leura Forest Stairs where I found a grim satisfaction in the upward rhythm and the fact that here was something I could tackle properly! 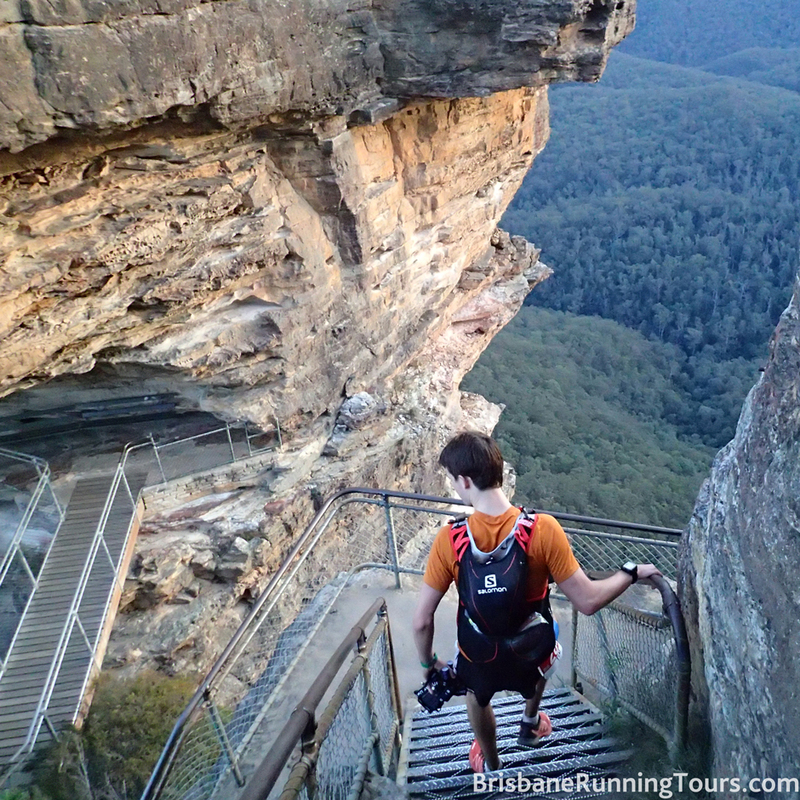 The stairs thinned the group out again and it was just the two of us by the time we came to Wentworth falls. Passing through the car park, we were cheered vocally by an amazing family of five who made up for their small number with great enthusiasm. We turned our head torches off to admire a spectacular orange moon that was rising beyond the trees and glancing back saw nothing but black. This incredible, tiny cheer squad was waiting in the dark for their runner to pass. Going down again was becoming far more painful and I came to dread each telltale drop in the terrain. We had to take the tiniest of descents very slowly and often found that they were followed by a period where walking on the flat was slow and excruciating. 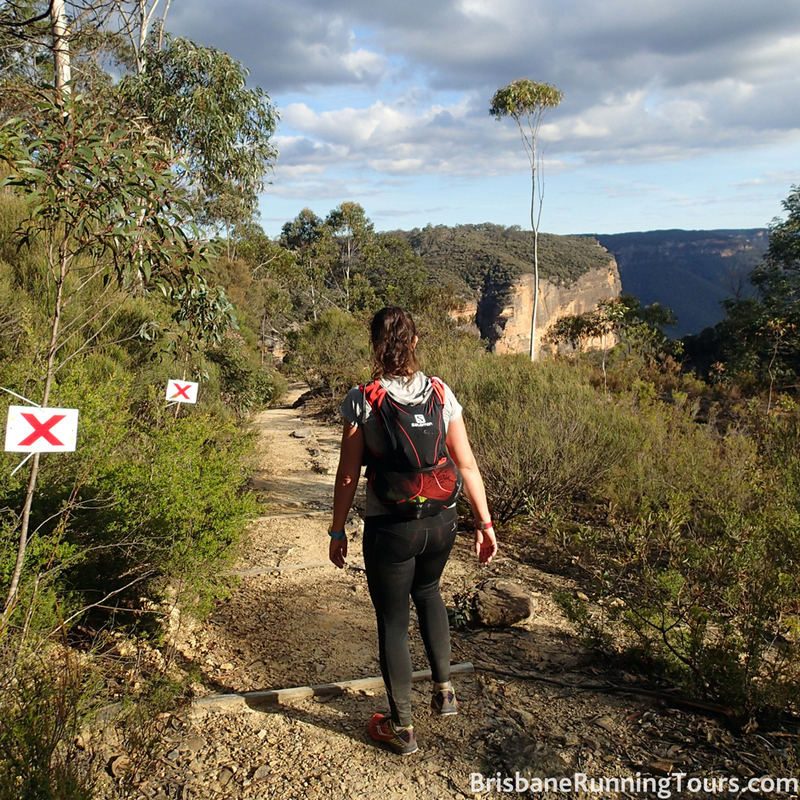 Luckily, there was plenty of stairs up and after passing Wentworth Falls, we made steady progress back up towards the fifth checkpoint. We were making good time and were excited that our goal of starting and finishing on the 17th May was looking good. Tim ran ahead as we approached the final checkpoint to lay out the food and drink so that I could stop as little as possible. As I trekked back out of the checkpoint, he went in search of more painkillers, catching back up to me with pills and bananas a little way down the road. This is where things really went downhill, literally and figuratively. We hadn’t studied the course elevation in too much detail, knowing only that the there were hills throughout and a long climb at the end. Rookie error! Just outside of Checkpoint 5 is the longest descent in the race; the point where people let their feet go and catch up a few minutes before the final push. The road winds downwards almost continually for about 6km to reach the lowest point in the whole race (again.. literally and figuratively)! It very quickly became apparent that I couldn’t walk forwards down a hill. Sideways wasn’t much better. The pain was making me feel sick but we couldn’t very well stop altogether. The piggy back option, which Tim kept offering, wasn’t really in keeping with the rules or my dignity. Tim’s other idea of trying to descend backwards had more merit and actually worked – in a fashion. We had to move very slowly over the uneven terrain with Tim holding my hands and using them like reins to steer me as I put one foot behind the other. There were plenty of jokes and lots of concern from the runners passing. One asked if we were going for the backwards course record, another thought I was wearing my head torch backwards before we decided it would be easier for me just to turn it off. Along with the slow going, I was getting a little sea sick with the backwards movement and we would frequently stop so that I could have a breather and a little ‘regroup’ before starting again. Tim commented that this was a good pressure test to see what I’m really like before he marries me. I would have to say the same! It can’t have been easy guiding me so slowly, sitting with me when I felt off colour or it got too painful and generally being incredibly patient when he could probably have finished hours earlier. But he did it all and through the very longest, lowest, most painful points of the entire day, we made it to the bottom. Never had I been so happy to see the land start to rise! The pain, coupled with walking backward had made me feel really sick. That said, there were plenty more dips to keep us on our toes. We had well and truly lost the familiar faces of earlier in the day and made some new friends whom we passed on the uphill and lost again on the tedious downhills. Eventually we lost them too. All hope of a same day finish was well and truly gone. A belt buckle was highly unlikely too. At this stage, we were all about the forward motion, however slow. The five kilometre markers seemed to be coming at ridiculously long intervals and the emergency aid station at 91km never seemed to get closer. I was trembling quite a lot and Tim took control and made me put on all of my gear, waterproofs and all, which helped a lot. The eventual sight of the aid station was a golden moment – just 9km to go! We knew it would be the slowest 9km of our lives but the distance was something comforting and familiar and our spirits were lifting along with the terrain. A fire trail led away from the aid station and before we left this road, our head torches illuminated something stocky and alive. 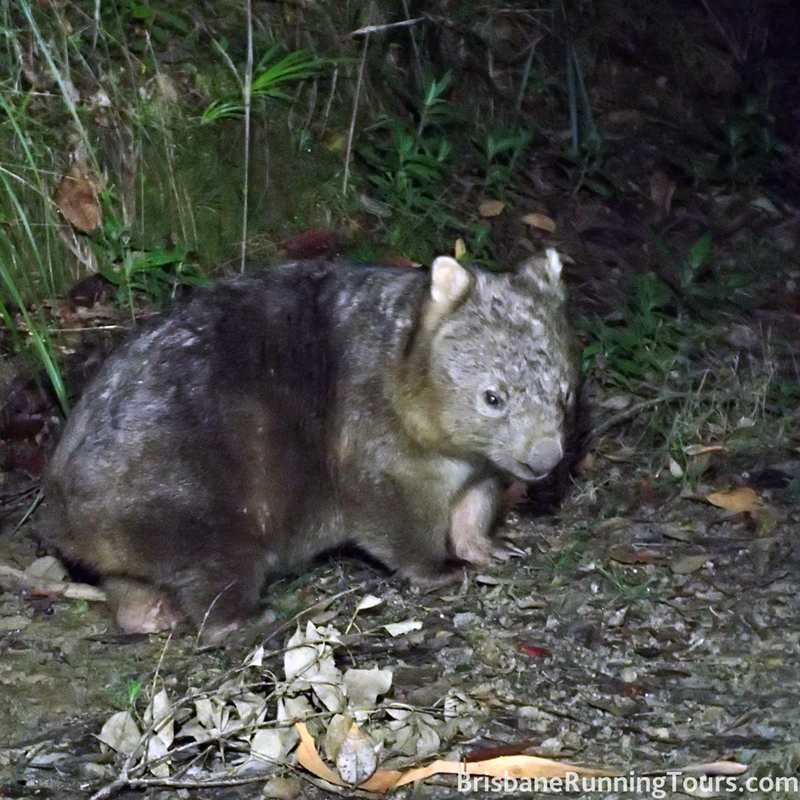 My first thought was a wild pig but we suddenly realised this was a real life, wild wombat! I’ve never seen one outside of a zoo before (no doubt something to do with rarely running around the bush in the early hours of the morning) so I was as excited as Tim and as we took off, we called to the runner behind who also stopped to appreciate this little bonus prize. The fire trail petered out and were back on single track. We passed a few runners who looked totally spent, inching forward at a snail’s pace. One runner passed us calling out that we could all still make 20hrs. Tim waved her on encouragingly and told her to go for it alone. We weren’t going to be moving any faster. My whole leg had settled into a constant ache after the long downhill battering and I was feeling really nauseous – probably a combination of painkillers, lots of sickly race nutrition and 20 odd hours worth of adrenalin coursing through my veins. Despite this, I was thrilled to be reeling in the last kilometres – as slowly as they ticked past. Just five to go now! ‘We’re all going to make it,’ I said to one man as we passed. He couldn’t lift his head but I hope he appreciated it. With hours before the cut off and no more aid stations, crossing the line was all but inevitable and I was so happy about that! The last hurdle was the Furber stairs. What a way to finish! Each flight was a slow progression closer to the top and each landing was an opportunity to bend over and take in the cool, dark air. We caught up to the lady who had been chasing her 20hrs, disappointed but not surprised to see her reeling with nausea but happy that she had caught some friends. ‘Nearly there,’ we encouraged them as we passed and then suddenly the stairs ended and we were at Scenic World. A few, brave spectators lined the boardwalk at the top of the stairs and yelled with excitement as we passed into the almost deserted finishing shoot and crossed the line at about 4am, tired, sick, sore and ecstatic! The finish line, a bit later than planned! What a day and what an event. It was so well organised with an army of amazing volunteers and organisers making sure we were safe and supported and it was so inspiring to be a part of something special. Very few people can say they’ve run (walked and hobbled!) 100km let alone one of the most beautiful and toughest 100km in Australia. We’ll definitely be back to have another go at this race. I’ve got unfinished business with you, North Face 100! I wore through my new socks!